Eleven-year-old Tyra is stuck spending the summer with her irascible Grandpa Rudy in a lakeside town where she’s the only black person. Clearly this is going to be the worst summer ever. And a weird one, too. Every night, Grandpa Rudy disappears into the woods, hauling tools and maps. He’s searching for something, and Tyra desperately wants to know what it is. The Secret of Spirit Lake is a fun summer adventure that explores buried treasure, adoption, and the power of family. This is my newest book, for middle-grade readers (grades 4-6, ages 8-14, or so, but I think it makes a great family read). 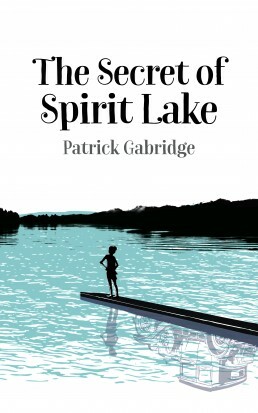 The Secret of Spirit Lake is available as a paperback that you can order from your local bookstore, from Barnes & Noble, or from Amazon. You can also read it as an ebook for Kindle or many other ebook options, including Nook and Kobo. Patrick Gabridge strikes gold in this fast-paced summer adventure story. Tyra’s summer at her eccentric grandfather’s house takes an unexpected turn when she witnesses his obsession with old maps, bootlegging history, and buried treasure. As Tyra aids in her grandfather’s treasure hunt – and embarks on her own journey to understand her adoptive family’s history — she unearths a buried treasure that neither of them expected. The Secret of Spirit Lake has all the ingredients of a timeless classic, with a contemporary, relatable heroine readers will root for. When Tyra is forced to leave her friends in the city for summer in the woods with a grandfather who’s the master of mixed signals, she’s pretty sure she’ll die of boredom. She couldn’t be more wrong—though dying is not out of the question in a town where the lure of long-lost treasure turns ordinary people ruthless. Gabridge weaves questions of family, identity, and belonging into a thrilling and increasingly propulsive tale that will have readers of all ages holding their breath till the last page.